Download for free the glitch PSD mock-up and use it to create realistic VHS tape effects in under a minute using your own photos. The glitch effect has all the layer styles intact and uses non-destructive smart objects and smart filters so you can make tones of adjustments in terms of color. The corrupt image effect can also be customized. Create realistic glitch VHS old tape effects using this free Photoshop mockup. The glitch style is created using a PSD mockup file that is so easy to edit and customize. The file has all the layers intact, uses non-destructive smart objects and smart filters, so you can obtain endless results. 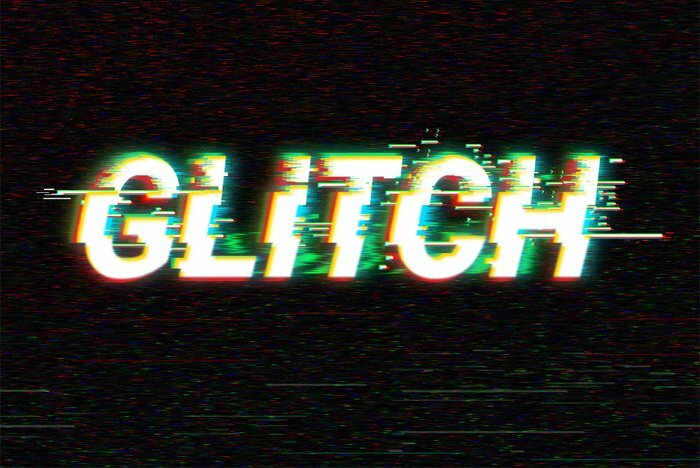 With a little bit of Photoshop skills you can even create animated glitch images. Open the PSD file called "GLITCH-MOCKUP-by-PSDDUDE.psd". Add your image inside the "ADD YOUR IMAGE INSIDE(www.psd-dude.com)" smart object. Double click on the smart object thumbnail to open and edit. Do this again with the other smart object. Save and close the 2 smart objects to see the result. You can customize the glitch effect using all the layers, adjustments and smart filters included in this PSD mockup. You can use the "ADD COLOR EFFECTS" adjustment to colorize the image using any color and gradients you like. These files are free for personal projects with attribution. All you have to do is to link back to our blog. You can NOT redistribute this file on other websites. You might also want to try this premium Photoshop action that allows you to create VHS style using text, shapes and images. Works perfectly with any type of layer and it is fully customizable and 300 DPI print ready. You can also try this new Photoshop action for creating animated glitch computer screen error effect out of any image. The glitch animated GIF can also be saved as static image. 5 comment(s) for "Glitch VHS Photoshop Free Mockup"
You have to replace the image. Open the "ADD YOUR IMAGE INSIDE" smart object and add your image inside. The VHS glitch retro TV effect can be used to add some digital creative effect on your text. You can easily add your text using the top smart-object layer. The PSD also contains 2 versions of the effect.